"SAW" ammo cans are also commonly referred to as "Fat" ammo cans. 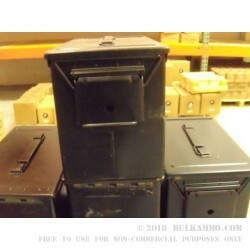 Question: what exactly can you do with an empty ammo can? More like what can you NOT do with an empty ammo can? Answer: just about anything. The M249 Squad Automatic Weapon (SAW) lives up to its name; with a blistering 850 rpm it will saw through about anything. It certainly saws through plenty of ammo. With that in mind, a lot of ammo cans are gone through feeding the hungry SAW. 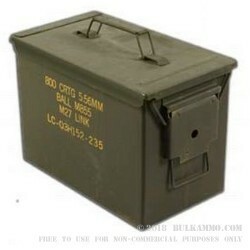 This can is called the “Fat 50” because it also doubles as an ammo can for linked .50 BMG cartridges. It will also accommodate twin strands of 5.56X45 linked belts for the SAW. Once retired from either of these services, well, it can do about anything you want it to do. Since it is completely sealed and built to keep ammunition safe from the rigors of combat (convoys, aerial pallet drops, ships, etc. ), you can bet it will keep any of your wares safe and secure. Emergency survival kit? Too easy. Important documents? Yep. Ammo? Obviously. Pick up a few SAW “Fat Fifty” cans now and see what all you can do with them; we think you will be pleasantly surprised.